Last week, House of Charity announced it would have to stop offering daytime hours at its downtown shelter, and wouldn't be able to sleep about 200 extra people on its floor as it has all winter, after a boost of funding it received from the city runs out on May 1. 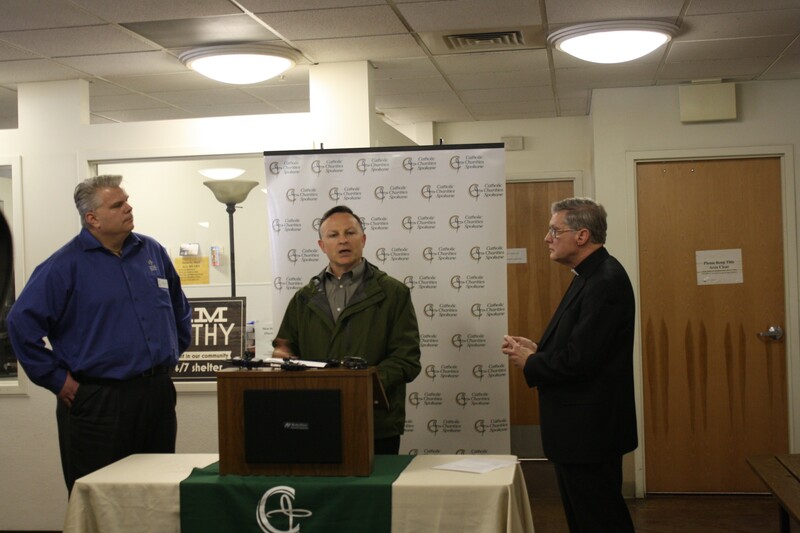 Downtown Spokane Partnership President Mark Richard speaks at an April 13 press conference about House of Charity funding. HOC last year with a $25,000 donation, and offered another $25,000 in matching funds, if other people stepped up to help out too. Until April 14, about $10,000 had been donated for the match, and then Vickerman & Driscoll Financial Advisors pledged $10,000, DSP reports. Kevin Driscoll told partnership staff that the firm had wanted to donate to HOC for a while and decided to take advantage of the match, DSP announced in a news release. "(HOC) provides vital services to some of the most disadvantaged members of our community," Driscoll says in the announcement. "We are happy to support them and would hope others join us to enable the 24/7 services to continue." The partnership is still looking for $5,000 to complete their match, and they have an easy way for people who want to donate small amounts to help. To donate by phone, text "Change" to 50555 and a $5 donation will be added to your next phone bill.